You’re a fine arts painter with a colorful aesthetic. 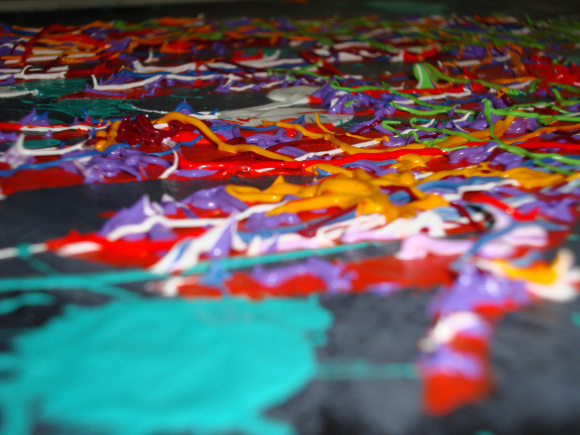 Your most recent work was an abstract oil painting with vibrantly colored lineal structures. You notice a local art gallery carrying a painting that appears to be authentic, but upon further inspection it is in fact your recent artwork painted over in black and white. What do you do? Your first instinct is to ask the owner to remove your name from the piece. The artwork is a complete modification of your original to the point where it’s essentially a new piece. Moreover, a black and white painting with your name attached may confuse your core audience, as you are known for your “loud”, multicolored pieces. If the owner refuses, what’s your next step? What are your rights to your artwork after it is sold? How can you prevent the new owner from attaching your name to a work of art that you did not create? Although extremely limited, Congress provided some recourse through the Visual Artists Rights Act of 1990 (VARA). The Act gives owners moral rights to works of visual art. Where copyright law protects economic interests, moral rights protect non-economic or personal interests, like reputation. Under VARA, Congress recognized that use of the artist’s work in a manner contrary to what he intended harms his reputation, which could affect sales of later work. It recognized the artist’s right to claim authorship of a work (right of attribution), and the right to object to modifications of one’s work (right of integrity). Remedies available to the artist include monetary damages, profit from sales, and injunction. Moral rights cannot be transferred to another because it is personal to the artist. As an artist, it’s important that you know how the law serves your interests. The bottom line is that even after your work is sold, you still hold rights that protect against mutilation, alteration, and destruction of your work. New owners must properly credit your name to work that you actually created. The Visual Artists Right Act seeks to encourage artists to create, while honoring the reputation of the artist and preserving his work once its created. Featured Artist: Sergei Vishinsky – www.vishinsky.com Sergei Vishinsky is a self taught artist who enjoys design, innovation and experimentation with multiple media. Art has always been a passion and has grown increasingly important in his life within the past few years. Sergei is a graduate from the University at Albany School of Business, and calls New York City’s northern suburbs his home. Blood, Sweat and…Tears for Fears? Can the Practice of Yoga be Protected by Copyright Law? Nerissa Coker is the Founder and Editor-In-Chief of CreativeArtsAdvocate.com. A graduate of Temple University, Fox School of Business, and Texas Southern University, Thurgood Marshall School of Law, Nerissa Coker is an analytical thinker and an appreciator of the arts. She’s worked in the fashion industry for several years in New York City prior to obtaining her law degree, taking on buying, production, and management roles. Her interests expand beyond just fashion to entertainment, media, and entrepreneurship. She loves the idea of linking the worlds of creativity, business, and law. Intellectual Property law is that link. She completed intellectual property coursework at New York Law School as a visiting student to further concentrate on this area. The purpose of this site is to support small businesses and help individuals protect their creative interests. Outside of work, Nerissa enjoys volunteering and serving on non-profit boards in her local community. By using the website, you agree that the information on it does not constitute legal or other professional advice and that you will not rely on the information for that purpose. For legal assistance, contact an attorney who is licensed to practice in your jurisdiction. The Creative Arts Advocate explores emerging intellectual property issues in every art form.